Photo resized then Exposure Corrected and Normalized with Showfoto.. I was going for a soft focus look so am glad it was notice.. As for the uninteresting part.. 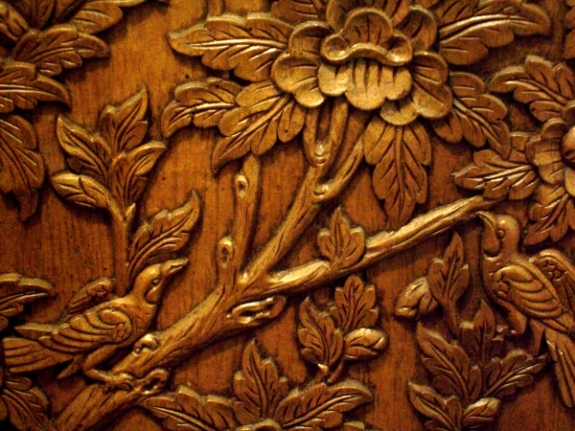 It is from one door of a 40+ year old hand carved solid teak wood cabinet.. The Thai's didn't use power tools in the 60's.. it speaks volumes in the skill and attention to detail of their work..
its a branch, but there's not much here that makes this an interesting photograph. It's a bit out of focus, the picture is a bit soft. A good find, however I think this is somewhat out of focus. Also rather than shooting straight on, a different perspective might have helped to add interest by showing the depth of the carving in shadow. Proudly hosted by Sargasso Networks. Current Server Time: 04/24/2019 06:05:12 AM EDT.